The streaming modes allow to transfer data continuously from PC to the pattern generator using a FIFO. The large on-board memory is completely used for data buffering making the output streaming rate very stable when used as a FIFO pattern generator. Data for the FIFO pattern generation can be loaded from disks or calculated on-the-fly for simulation applications. 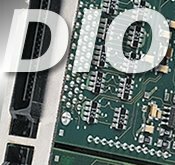 In contrast to other vendors digital I/O products the Spectrum products can also be use for fast streaming digital I/O applications where a continous digital data stream either has to acquired or to be replayed. Abonnieren Sie unseren Newsletter und Sie sind immer bestens informiert.